I tried the KonMari Method of organization in my home three years ago – it’s time to revisit it to see what’s working, what isn’t, and how I’d do things differently. Unless you’ve been living under a rock for the last few years, you’ve probably heard of Marie Kondo and her life-changing method of organization. It all began with her book, The Life-Changing Magic of Tidying Up, and just a few weeks ago Netflix released a brand new series featuring Marie Kondo organizing other people’s homes! The organization urge is real this time of year, and it seems that everyone is even more pumped to organize this year thanks to the KonMari craze. If you’ve been reading here for a while, you might remember that back in 2016, I went through the KonMari method of organizing in my home and documented the whole process here on the blog. I’ve got a ton of content on my site already related to the KonMari method, but as I was thinking about how I wanted to tackle organizing content this year, I realized that the only thing that made sense was to take on the KonMari method again. I’ll admit, I’m not a KonMari method purist – I don’t have the wherewithal to constantly maintain such a small number of things in my home, and over the years things begin to slowly creep back in. I imagine I’m not the only one who struggles with this! So, instead of presenting an unrealistic view of organization and telling you that this method will change your life forever and you’ll be organized for the rest of all time, I wanted to show up for you with a more realistic approach. This method is great. I’m a believer! But, you’ll probably need to revisit it over time – and that’s exactly what I’m going to do. We’re diving right back into the process, step-by-step, and I’ll be sharing my insights with you here on the blog. A fun bonus? I’m also going to be doing weekly videos of the process! Photos are great but they can only do so much to convey what it’s really like to go through every single item in your home. This kind of process is definitely best viewed in video form, so each week when I chat about my progress I’ll be sharing a blog post with photos and a video detailing how things are going. And on that note – here’s the first video! post to see the video. Alternatively, you can click here to watch it on YouTube. Before I dive right in to my second round of organization, let’s take a moment to revisit all of my old content about Marie Kondo’s methods of organizing. 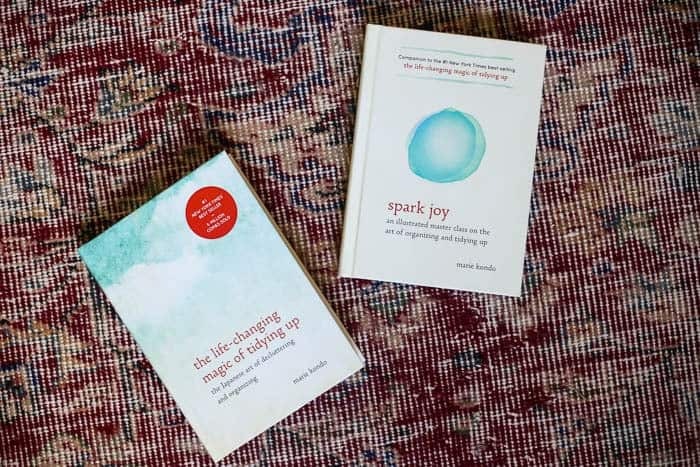 Feel free to browse any of the posts before you dive into this series – and if you were here last time, I promise you this will be a much more comprehensive and in-depth look into the KonMari method. So hopefully, even if you read my first series on this organization technique, you’ll still find value this time around. CLICK HERE to read all of my KonMari method-related posts! Discard items in your home that you don’t need or no longer bring you joy (more on that in a second). Decide where to store everything that’s left. Kondo suggests that we should go through every single item in our home, hold them in our hands, and ask ourselves if that item sparks joy in us. If yes, keep it. If no, get rid of it. It’s a fantastically simple concept, but in reality it’s a bit more complicated than that. I mean, my plunger brings me no joy, but I can’t just throw it in the garbage. It’s easy to make fun of this process, but the basics of it really are helpful – you should only have things in your home that are either useful or that make you smile. There’s no reason to keep a ton of junk around that isn’t doing anything for you. Once you’ve gone through the discarding part of the process and drastically reduced the sheer number of things in your home (I promise, you’ll be shocked at how much you get rid of! ), the next step is to find a place for everything. Marie says that you shouldn’t even think about finding places for things until you’ve finished going through everything, but I think if I waited to clean up until I had gone through my entire house, my head might explode. Instead, I like to clean up as I go and make sure to have each category organized before moving on to the next. Marie Kondo suggests that it should take you about 6 months to work through the process from start to finish. Of course, there’s absolutely nothing wrong with taking 6 months to complete the KonMari method and, if you’re really going all in with a minimal lifestyle, then I’d recommend that you take your time as much as possible. But, most of us are living real lives with real families and we don’t really want to get rid of everything in our homes – we just want to pare down. I know that sounds overly simplistic, but hear me out: It’s just stuff. I know we tend to attach a lot of value to the things we own, but in the end, everyone will be just fine if you purge your home. This should be exciting and fun and freeing. It should not be stressful in any way. If it ever becomes stressful, you should stop and take a break until you’re ready and excited to dive back in. It feels great to rid your home of all the clutter, and I promise you’ll be thrilled once it’s done. You can start by reading the book if you haven’t already, but I firmly believe that’s not really a required part of the process. 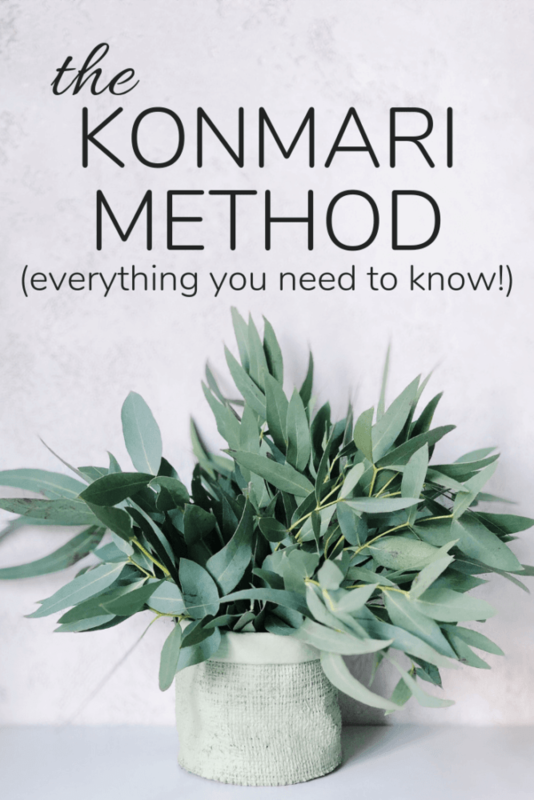 If you want to have the method broken down into bite-sized chunks for you, then just grab my e-book and see if that makes it feel more manageable. Better yet, commit to starting the process with me right here right now! I’ll be working through it with one topic per week, so all you have to do is promise yourself that once I’ve posted the new topic, you’ll dive in and purge that category before you read the next post. What order should I work in? The KonMari Method lays out a very specific order for decluttering items around your home, and I truly believe it’s the best way to work. Kondo says that you should work by category rather than by room, because we often have multiple things within a category (for example, towels) and if you do it by room you’re more likely to still end up keeping far more than you need. So, for example, instead of cleaning out one bathroom at a time, you’ll clean each bathroom by category – take all of the towels out of every bathroom, determine which ones to keep, and then re-distribute them. It’s a subtle change, but I really do believe it makes a world of difference when it comes to being thorough! That being said, there is a one big tweak I make to this process: When you reach the “komono” or “random stuff” part of the process, it can be really overwhelming to tackle it all at once. So, I break this down by room (Kondo separates it into sub-categories, but I find that once I reach that point it works best for me if I shift to decluttering one room at a time). I’ll discuss this in more detail when we get to that part of the process! Why this order? Kondo lays out the categories in a very specific manner, working from easiest-to-purge to hardest-to-purge. It allows you to gain a little confidence as you go and by the time you’re at the most challenging part (sentimental items), you’re an old pro. How do I do it with a family?! This is one argument I often hear against the Konmari method. Hear me out – you can still do this. I have two kids, two dogs, and a multitude of junk. You don’t have to be all in on the method in order to benefit from it – you don’t even have to get your entire family on board! Even if all you do is work through the things that are solely yours (or that your family won’t mind/notice if you get rid of), you’re going to make your house feel lighter, cleaner, and more organized, and that’s the goal! Plus, once your family sees how much better things are once you start purging a bit, it’s likely they’ll hop right on board with you! If you have reluctant family members, I recommend you just start off by organizing the things that won’t directly affect them. Your clothes. Your books. You might just be surprised at how quickly they come around! I’ll be back next Wednesday (and every Wednesday for the next few weeks) with a new post and video detailing each step of the KonMari method. I would love it if you join in with me and commit to decluttering your house too! If you’re in, just comment here and let me know that you’re ready to dive in with me, and then show up next Wednesday morning for the first assignment. Also, be sure to subscribe to my YouTube channel so you don’t miss when I post the newest videos! Please note: I’m updating this list as I add new posts! Check back next week for more, or check the homepage! Many Emergency Departents in hospitals, especially in California, are now mandated to feed and clothe homeless patients (among other things ) before discharging them. As you declutter closets, consider donating to your local ER, even before thrift stores. Just a PSA from a nurse in California. I will be doing this too. This is great information, thanks for sharing! I’ll definitely look into this! I am SOOOO ready to do this!! There’s just so much JUNK in my house!! My husband is tired of all the junk too so I hope he’ll be on board with getting rid of it all!